It doesn’t get much more quintessentially “wedding” than white lace, evoking the purity of wedding dress and veil. We use beautifully decorative white lace on our Gaea collection. This combines with gorgeous cardstock, a dazzling embellishment and choice of ribbon and cardstock colours to cater for a sympathetic or contrasting, bold scheme. We exclusively use Berisford and Satab ribbons for our fully-handmade collections, with a huge amount of colour choices on offer and a non-fray, double-sided finish. For this design we use 35mm ribbon and have used “Bridal White”. The choice of colours available can be seen by clicking below. All embellishments are shown below in their respective price bands - as standard Gaea is priced with a “Band A” embellishment which can be upgraded to an alternative, such as the “Band E” embellishment pictured, which is called “Coco”. Upgrade pricing is shown at the foot of this page. 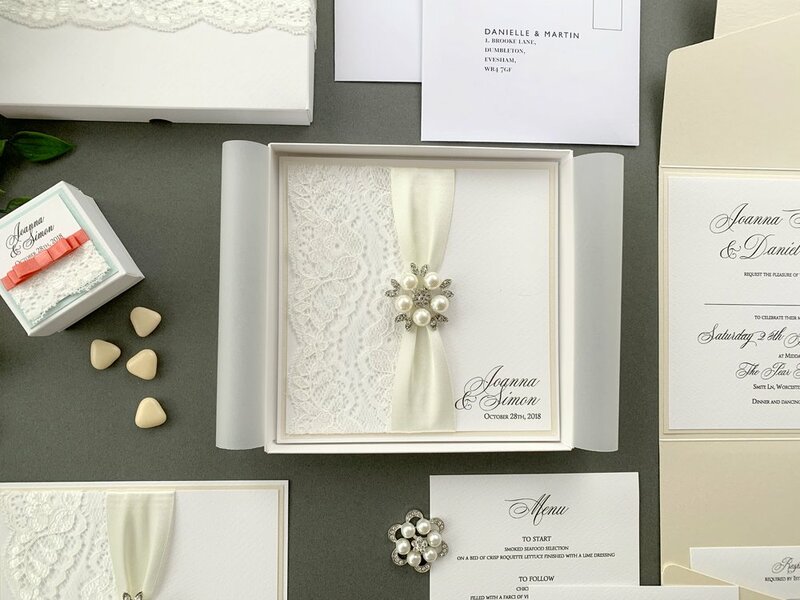 Gaea is provided as standard with a white base layer, for the folded day invitation, flat evening invitation, or pocketfold invitation. The “matting” is coloured as standard, which is the layer that sits between the base and the top - we’ve used “Ivory Pearl” in the pictured example.